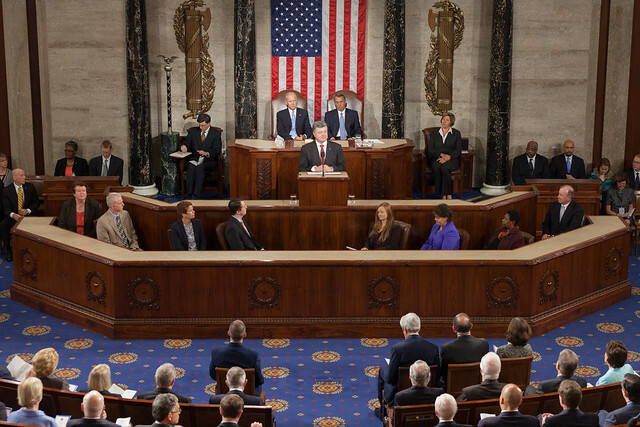 Beginning in the early 19th century, Congress has invited many foreign leaders and dignitaries to give addresses in their Chambers. Originally, the standard practice was for the House and Senate to receive the visitors separately. The first to do so was with the Marquis de Lafayette, a French General who served in the Revolutionary war, addressing each on December 10, 1824. The House has received 48 dignitaries this way, although the practice fell out of favor following World War II. The last leader received by the House alone was Mexican President José Lopez Portillo on February 17, 1977. Following World War II, as the United States became more prominent in global affairs and politics, and Congress began using joint meetings more frequently to host visiting dignitaries. These meetings are used only for that purpose and for special commemorative events. To hold a joint meeting, both the House and Senate declare a recess, either by a resolution or unanimous consent, so they can reconvene together. This became the standard practice beginning with the joint meeting for British Prime Minister Winston Churchill, who addressed both the House and Senate in the Senate Chamber on December 26, 1941, a mere three weeks after Pearl Harbor. The Prime Minister came to discuss America’s involvement with the Allied forces in World War II. The smaller chamber was used as many members had returned home for the Christmas holiday, and the 96 seats there could only just be filled with the remaining Members, Supreme Court Justices, and cabinet members. 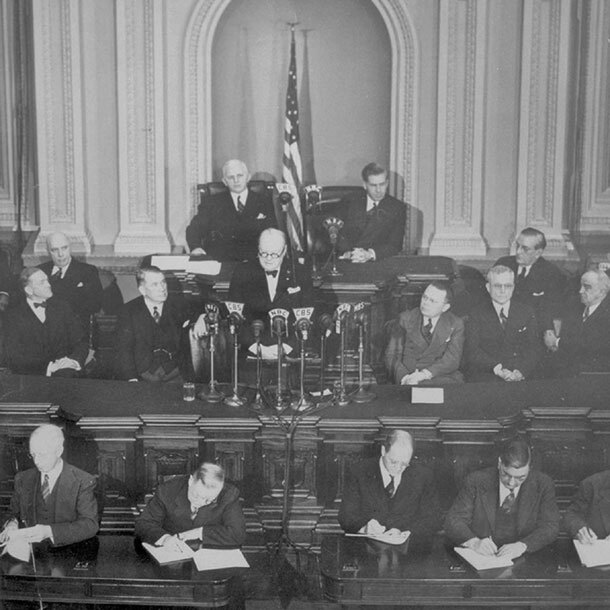 Two dignitaries preceded Churchill in addressing both bodies of Congress jointly. King Kalakaua of Hawaii was the first foreign leader to do so in 1874, and Ambassador André Lefebvre de La Boulaye of France following in 1934. Churchill was the third, and returned two more times, in 1943 and 1952, giving him the honor of addressing Congress more times than anyone else. The only other dignitaries who have addressed Congress more than once were President Nelson Mandela of South Africa (in 1990 and 1994) and Prime Minister Yitzak Rabin of Israel (in 1976 and 1994), and Prime Minister Benjamin Netanyahu (in 1996 and 2011). In total, 110 leaders and dignitaries have addressed Joint Meetings of Congress. Joint sessions, which are convoked per a concurrent resolution, are generally only used for Presidential addresses like the State of the Union and to count electoral votes for the President and Vice President, but they have been used twice instead of joint meetings to host foreign dignitaries. The first occurred in 1934 when Ambassador de Laboulaye memorialized the centennial anniversary of Lafayette, and the second for Ambassador Guillermo Belt of Cuba in 1948 to celebrate the 50th anniversary of Cuba’s independence from Spain. 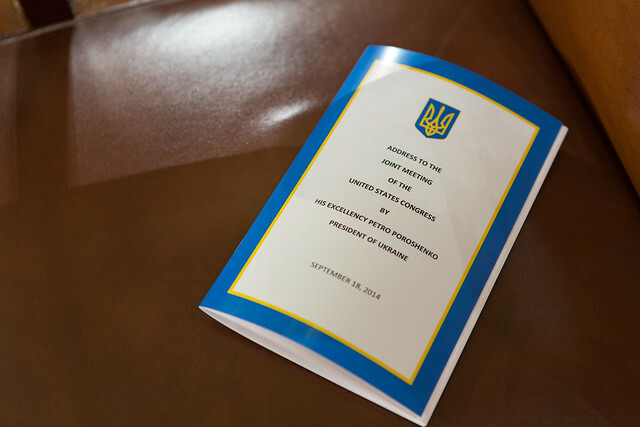 The most recent foreign leader to appear before Congress was President Petro Poroshenko of Ukraine, who spoke on September 18, 2014. He asked Congress for help in his country’s ongoing struggle with Russia and received strong bipartisan support. 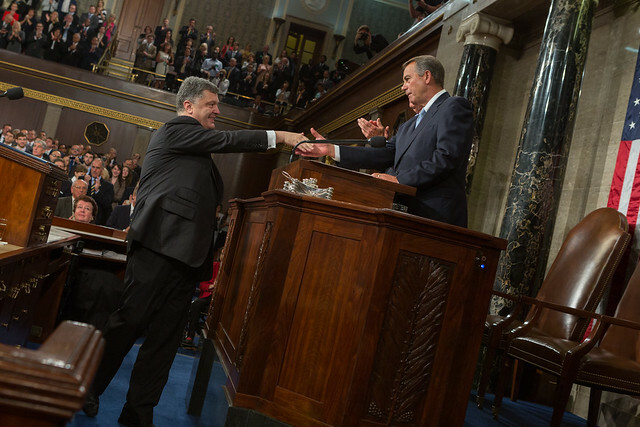 You can find more details on President Poroshenko’s visit, along with a video of his speech and reactions from Members of Congress on our coverage from that day here. The following pictures from that day were posted on Speaker Boehner’s blog on September 25.